I’m in heaven here. At the bar where we ate last night, we got a full English this morning, what a change from a bit of pastry and coffee. It was decent bacon as well. 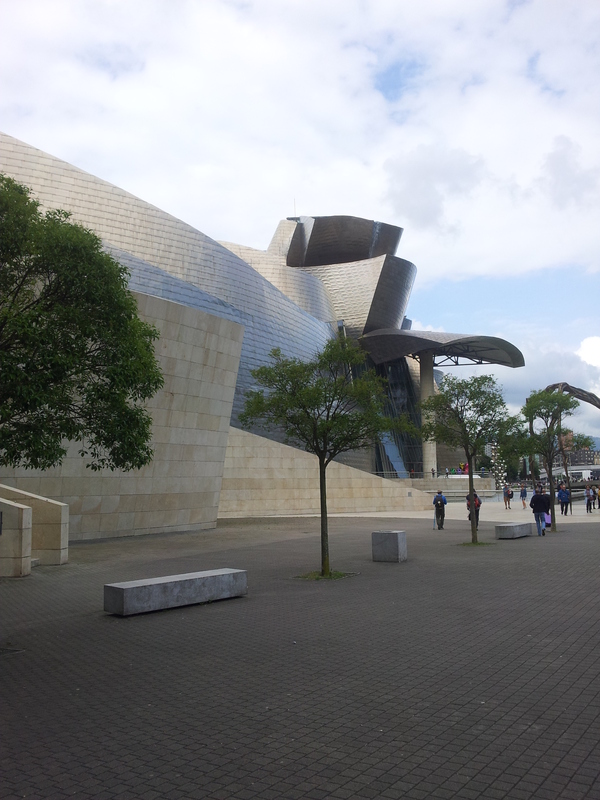 We walked up towards The Guggenheim and passed a fountain with a lady playing a lyre. It had an inner pool and a shallower outer ring with a rounded top wall. Well it was just too tempting. Boots off and we sat there with our feet in the cold water. 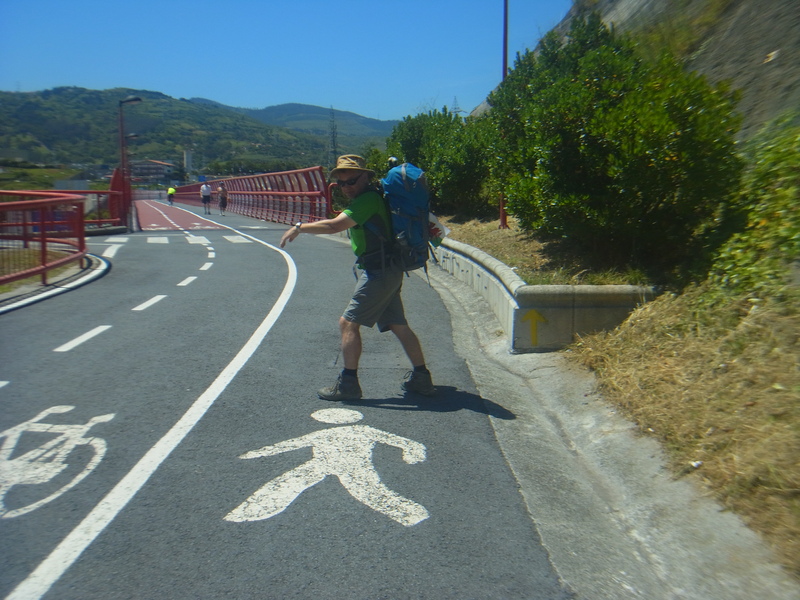 The Camino South route out of town passes this way and we called to many pilgrims to join us, but non did. They really do not know what they are missing. We walked later to the Guggenheim. It was closed today apparently, but I had no real desire to go inside. Now the open air café, that was another matter. Time for our new favourite, café con leche con hielo again. It was nice here with just enough shade. For lunch we again stopped at Eroski. We bought some drinks and pasties. I rather liked the look of the tuna, but Viv wanted the triangular ones, so we ended up with Jamon y Queso again. We explored the big space nearby, that was formally a market but now an arts centre. It was cool inside here without any air conditioning, just the way it was designed. They had a cinema in here as well as galleries and some unusual sculptures that you could sit on and rest. Time for another beer so we walked over to the old town again. There was a shortage of tables outside and we were joined by a Scottish couple who were touring in their VW campervan. He looked just like Billy Connelly names of Martin and Janice. 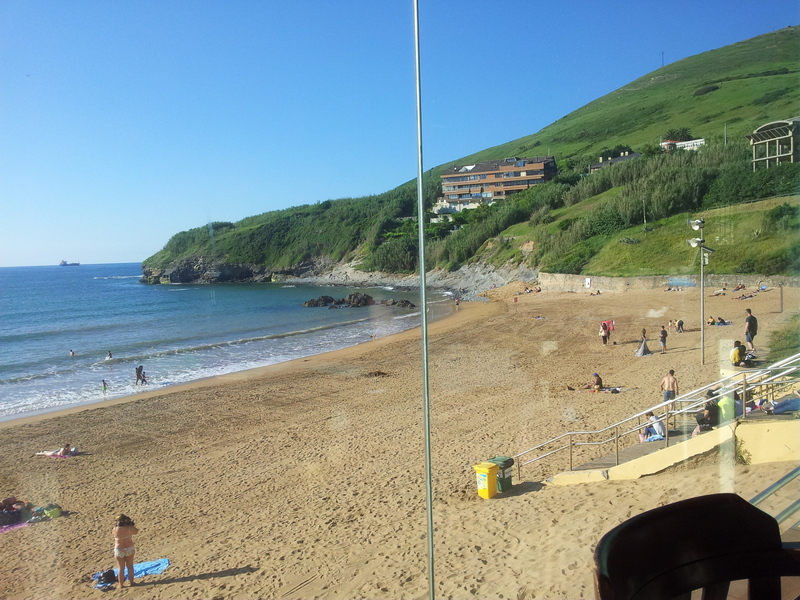 There were off to Santoña next and like us were finding it hard to find places to stay. We liked it here so we stopped for another café con leche con hielo. The temperature on the bridge as we crossed was 43degrees glad we are not walking today. So we went for a siesta. As everyone here says “ocho” when we ask for food, I thought we would try Telepizza again. I could not find it so I went for hope over experience and tried the tourist info. The girl there did not seem happy. Perhaps she was thinking “All the things to see and do here, and I get asked for Telepizza” still she came across and we found it on the other side of the river. We had the place to ourselves at this time. So when we finished we went over to the bar in our street. The temperature on the bridge was still 28degrees at 9:00. The morning was much cooler the temperature had dropped ten degrees and we went back for our English breakfast again. The Carrefour in the station always has a queue for some reason but it was a handy place to stop for some drinks. We called in the local bar again but they had no Tourino so we left disappointed. We had stopped in a place called Gallofa in Santander for some pizza slices, but on our return trip we were surprised at the price. There was one here as well so we called in just to check. Well two small pieces for 9.25e, I just can’t believe we paid that much first time. A local panaderia just up the road supplied us with some cheesy sticks and cold coffees that kept us sustained until we caught our taxi to the airport. True to her word, Viv never stirred until 7:30, by then almost everyone had left, Ed Sheeran was playing on the radio and the hospitalerio was brushing up. As we walked through Pobeña we were met by a German from the albergue. When we had crossed from La Arena the first time it was hard to see the way to the albergue, but easy to see the stairs out. Now from the albergue it was hard to see the stairs. We directed her to the stairs and told her to ignore the no entry signs. I am still not sure if she understood about the closed path though. Now it was past eight so bars were now open. We stopped for coffee toast and juice, how all days should start. While we were there we saw a guy struggling to get off his bike and ask someone for directions. When I watched he remount his bike, I realised he had only one leg and marvelled at his bravery. To do this is hard for everyone, but on a bike with only one leg. He has my absolute admiration. I just hope that the guy who gave him directions knew a way that avoided the 180 steps the other side of the beach. I know this route quite well now, but still struggled on the first part. The path off to the right was not in the right direction, but was the way to go. Then there were some big loops to avoid by taking short cuts. This was, after all, a cycle way. At the highest point was a cross roads and we had to wait for pilgrims to see which way to go. I remembered the shortcut through the houses however, but the bench where we had rested was now occupied. As we got nearer to Ortuella I worried that we would not find the turn off. This was an alternative route where we could find coffee. In the end we stumbled on it quite by accident and enjoyed a good break. Then our troubles started, I tried back following the arrows and ended up behind some garages. A local could not help as he only knew the way in a car. We came into a dead end street that backed onto the autopista. The next one to give us directions, we thought was directing us to Santiago, but he said both ways we need to go that way. 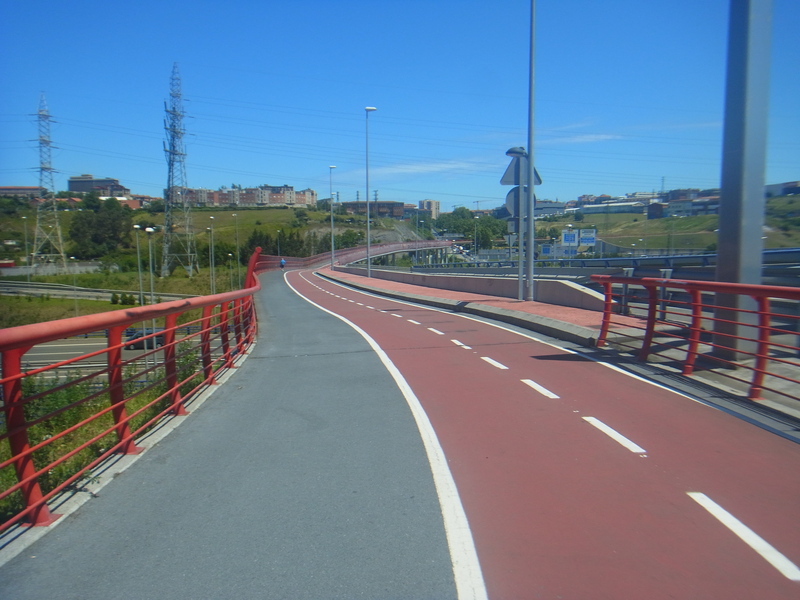 After negotiating a coupe of roundabouts we came at the top of the cycleway, where the bridge crosses the autopista. Now we knew where we were. 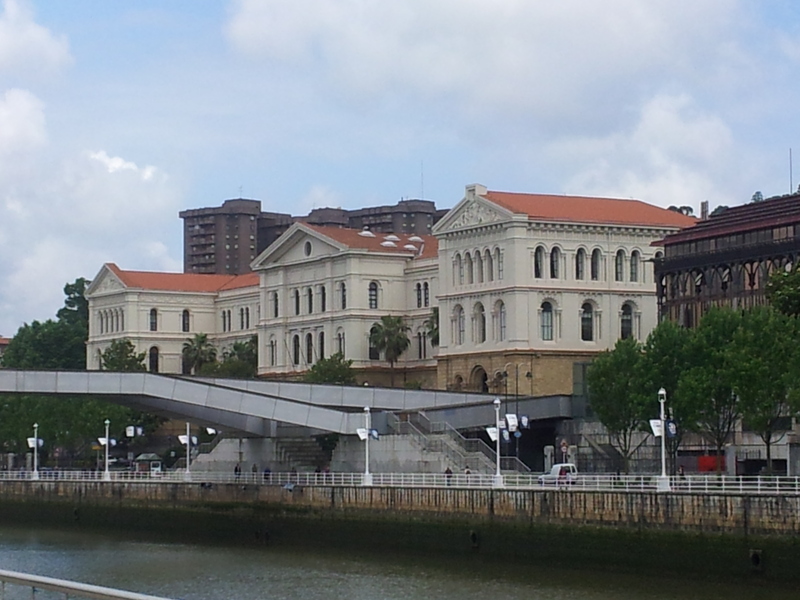 It was quite straightforward from here into Portugalete, once over the bridge we just followed the road into town. We stopped off at a café once there. I had seen someone drinking coffee with ice in it, so I thought I would give it a try “Dos café con leche co hielo” I tried, and it worked. I got two coffees and two glasses with ice in them. I have not had sugar in beverages for 39 years but this, I felt, called for it. They were just like the cold coffees we had from the supermarkets. I had no intention of going through all that industrialised area again or getting tangled up in the road system, so from here it’s the underground. I needed some help, so asked at the ticket office. The lady there just showed us how to use the machine. Then the trip into town was a doddle. In the town, the tourist info was again as much use as a chocolate fire guard. So we just wandered and found a pension with shared bathroom at 45e. There was a convenient bar at the end of the street we got two beers and some pork scratching’s, I asked what they were called “Tourino” she said. When I told here what we called them she said “madre mia”. I have no idea why she found it shocking. They were massive and incredibly tasty I am not even certain they were pork. Around the corner was an Indian restaurant. We sat in the bar opposite for the 19:30opening time. At 25 past seven the shutters went up and we walked over. “Es cerado” the guy said, so I said “Que hora abierto” “half eight” was the reply in English. Back to the bar opposite for a burger then. Good choice actually, the food in here was excellent, so was the beer and it was cheep to boot. 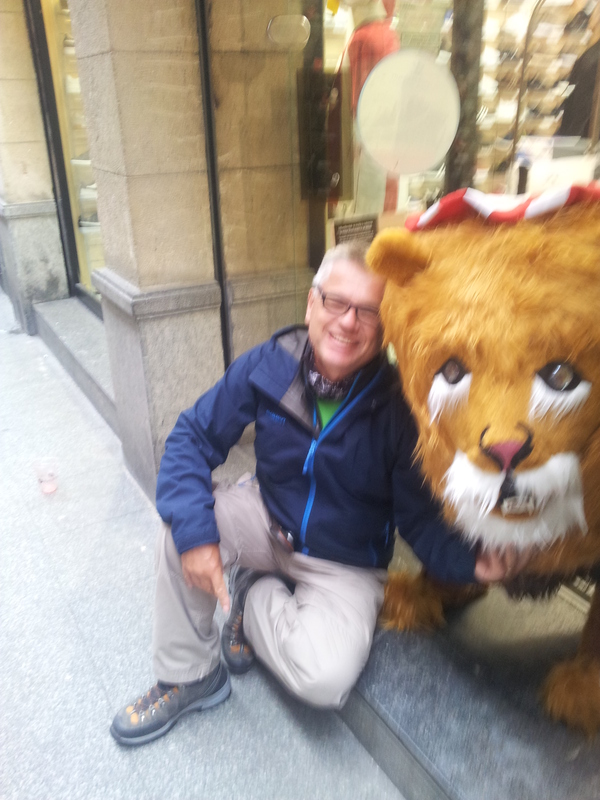 I wanted to take the underground to Portugalete but Viv was insistent on walking. We walked the East side of the river was boring and we had done it before so we elected to walk the west side. This, in hindsight, was an error. The first part, walking out of the town itself was fine. There were many parks and flower beds, but we soon got tangled up with the new roads. At one point we ended up in a dead-end part of town and had to back track to get back on the route. Then we came close to crossing the river on an arterial road, it was difficult to say the least. We came up behind two guys navigating with their phone and managed to get the drop on them when we took a short cut. Then when finally clear of the main roads we ran out of arrows. 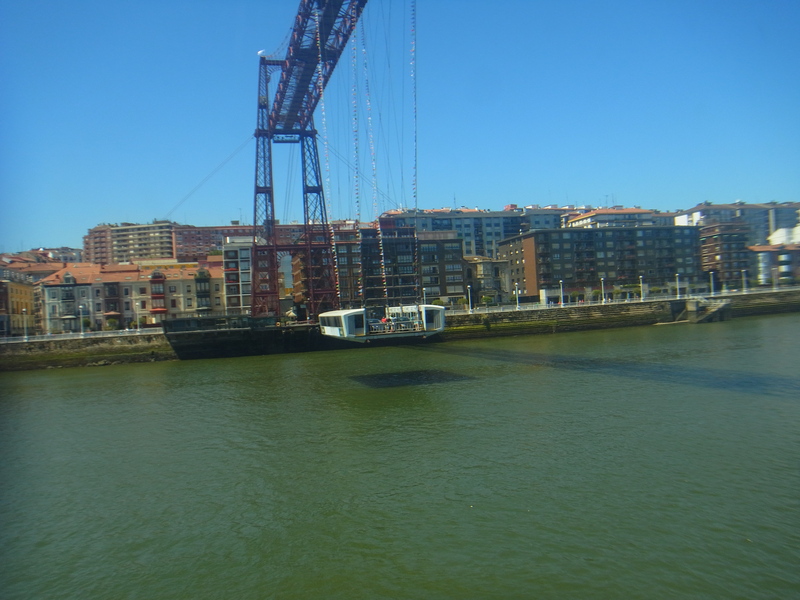 Finally they took us down to the river in Portugalete, a pointless exercise, as we then had to climb back up. Thank heavens for the travelators. 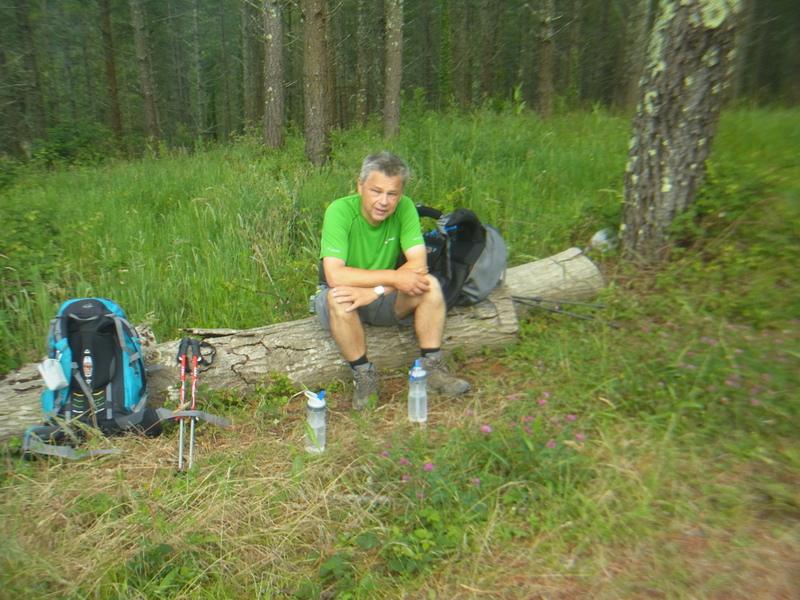 We bought some bread and meat at the bottom and stopped for some lunch halfway up the hill. We stopped again at the top for some coffee and a comfort break. This time we did not stop at Ortuella as we had already stopped, maybe on our return. We did stop later just short of Kardeo in a nice spot by the houses with benches for us. We managed to get an apartment at Apartmentos Playa de la Arena. Expensive for us but a nice luxury and the only place to stay here. Ate later at Maloka Sunset bar, a bit like the sunset bar in Ibiza, but we would not be staying up for the sunset. The need to be out early next day was too great. Viv likes the rice dishes here, but we came very close to getting three of them instead of two. I will have to be careful how I ask in future. Since our second Camino I have had a desire to fill in the bits we missed. We missed the whole of the second half of El Norte because I got lots and ended up doing El Primativo. Then for logistical reasons we missed the high “Hospitales” route and did the lower Pola de Allande route. The history lesson that I had in Casa Ricardo inspired me ( Tineo to Pola de Allande 25.7 kilometres ) and I was determined to go over the top. 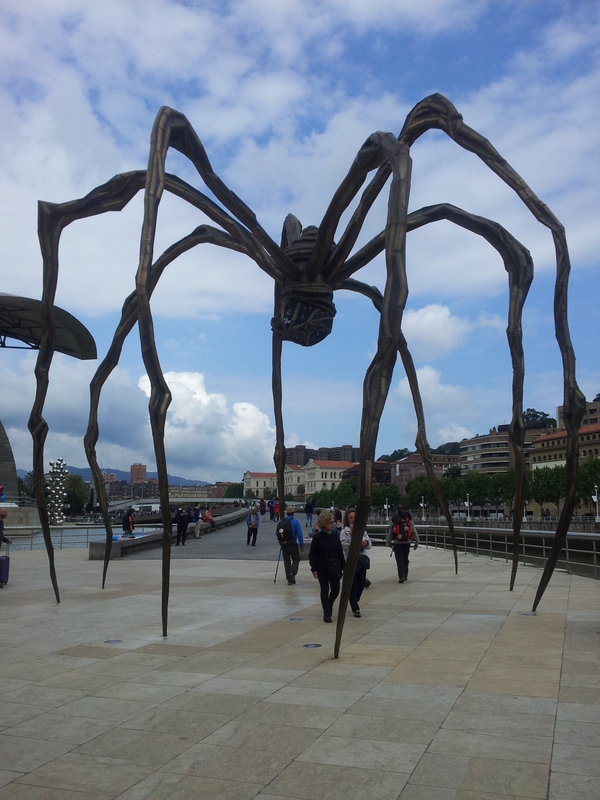 So I booked flights out and two nights stay in Bilbao, and this time a return flight as well. For some reason on the flight I was terrified, was it perhaps the program I had watched on the crashing Space Shuttles? I don’t know. I just know that I was happy to land despite the rough landing. There were no signs in the airport and I missed the loos. When a lady told me where they were I was just on the escalator. I suppose you should not try running up a down escalator in hiking boots, but I was desperate. Then when I tried to leave the loo the door again had no sign, I panicked when it would not open. How was I to know I should be pushing, not pulling. The carousel for the bags was not signed either so further delays. Finally outside we were surrounded by autopistas and the GPS was not about to recognize an address in Basque. Time to admit defeat and take a taxi into town. We were running later than planned and there would be enough walking for us the next eight weeks. Not sure if the guy at Pension de la Fuente remembered us, but we recognised him and already knew our way around the place. So we went out for some beer and then it was time for bed. The following day we walked to the Guggenheim spent some time exploring the exterior but every source we had said inside was not worth the visit, so we just explored outside. 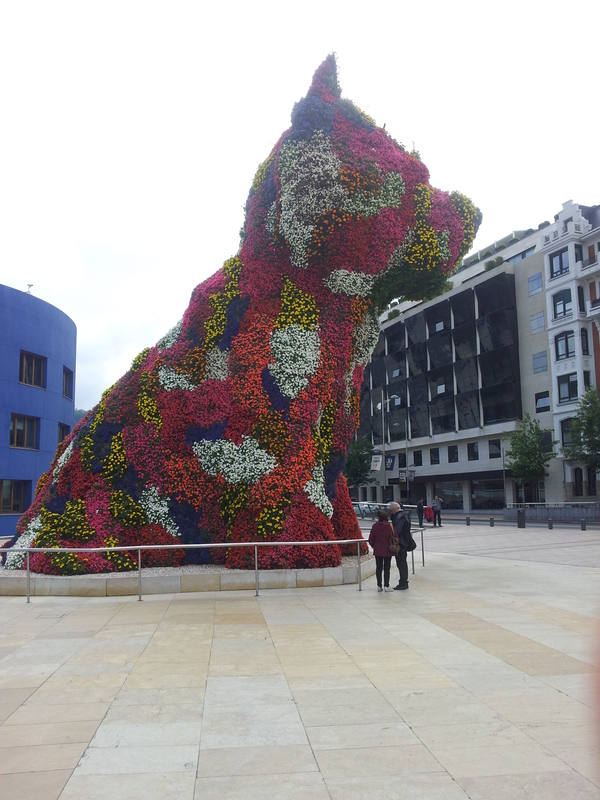 The Puppy was well worth seeing though, stainless steel structure and planted with begonias. We went to look at the Plaza del Torros as these are usually exceptional buildings, this one however was a disappointment. Built in the brutal style of it’s year 1968. Many beautiful buildings here, but this was not one of them. We finally managed to get that frozen yogurt though. It must have been a result of the hard day yesterday but we slept until after eight, a disaster on the camino. Still no point in dwelling on it at least we were refreshed. We found our way down to the river and a good breakfast. English breakfast 5e, well rude not to. The bacon is not quite the same and the sausages are frankfurters but top marks for trying. Further along the road we found a ferreteria open. Viv wanted tips for her trekking poles, now how to ask for them? In Argentina they sell tyres at a Gomeria so why not “Hay gomers para estos?” “Si” came the reply, must be getting better at this. We stopped at the Youth hostel for a stamp, they were reluctant as we had not stayed there, but in the end, well it is only a rubber stamp after all. We carried on along the river and some old guy gave us some advice about the route. Viv asked what he said “dunno made no sense something about turning right”. About 50 yards further there was work going on and we could not pass, now his directions made sense and I silently thanked him. 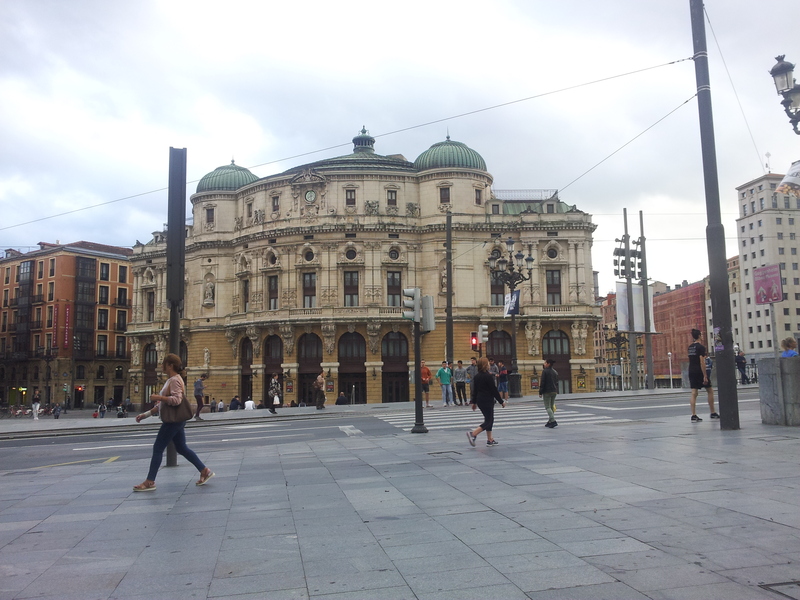 Nearly two hours and we had not yet left Bilbao, not even crossed the river. Time for a drink, the guy would not sell us gaseoscould a only beer and gaseosa. Because it was so late the guy though we would stop in Potugalete ” you will never make Pobeña” he said. We thanked him for his advice and then promptly ignored it, it was after all only 22k, we could eat that even if we were late. We were headed for the Puente Colgante, no idea what made this different but we were about to find out. The “bridge” was in fact a giant cable car. Not even this strictly speaking. There was a bridge structure at high level and suspended beneath this was a large gondola that took cars and pedestrians alike. 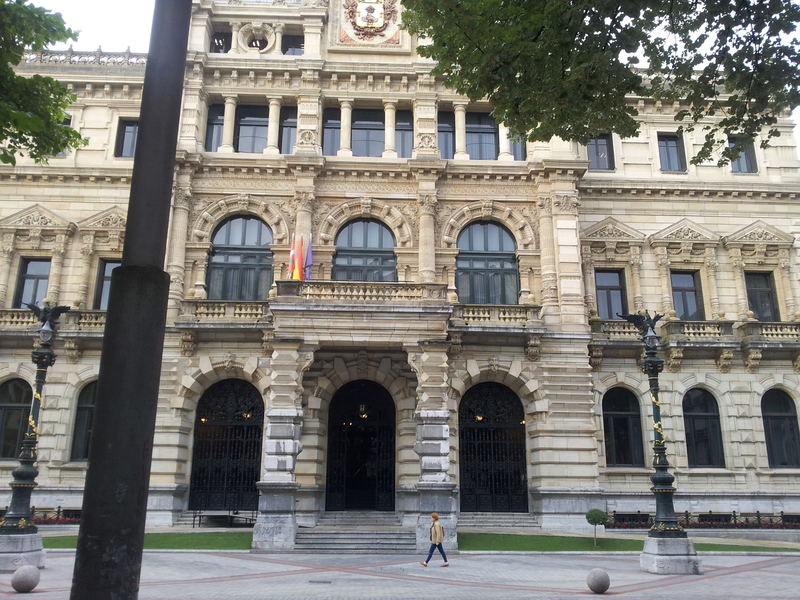 As we struggled to find out how to pay for our tickets the two Swiss girls arrived apparently they too had arrived late in Bilbao. Well the climb from the bridge was a pleasant change, travellators. Must write to the Confraternity and ask if we can have more them. At the top there was a nice seating area, so we sat in the sun eating a bit of fruit and drinking some water. We had had too much coffee and it was too early for beer, apparently. 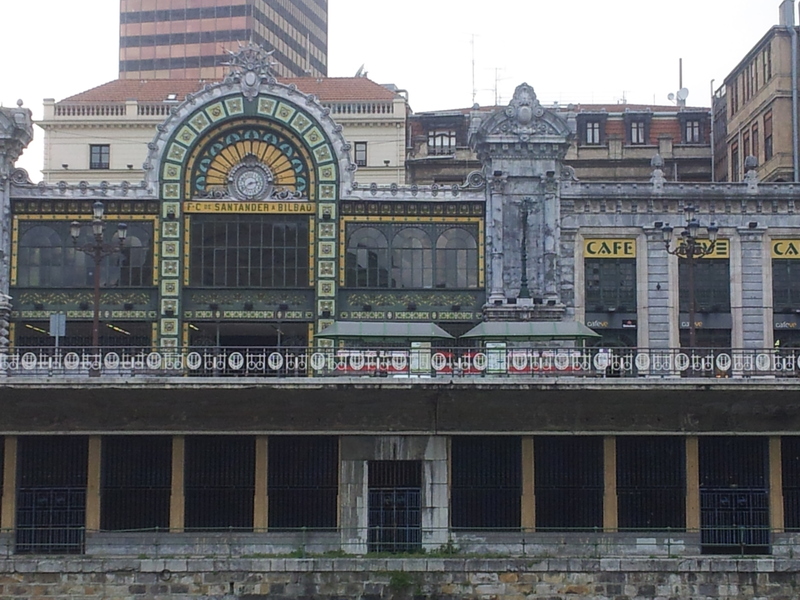 Well Portugallete was quite a pretty place with plenty of shops and bars, but we were still in Bilbao. The guide book had said take the metro, I would have taken their advice, but Viv is a walk all the way carry everything and don’t take short cuts type of person. 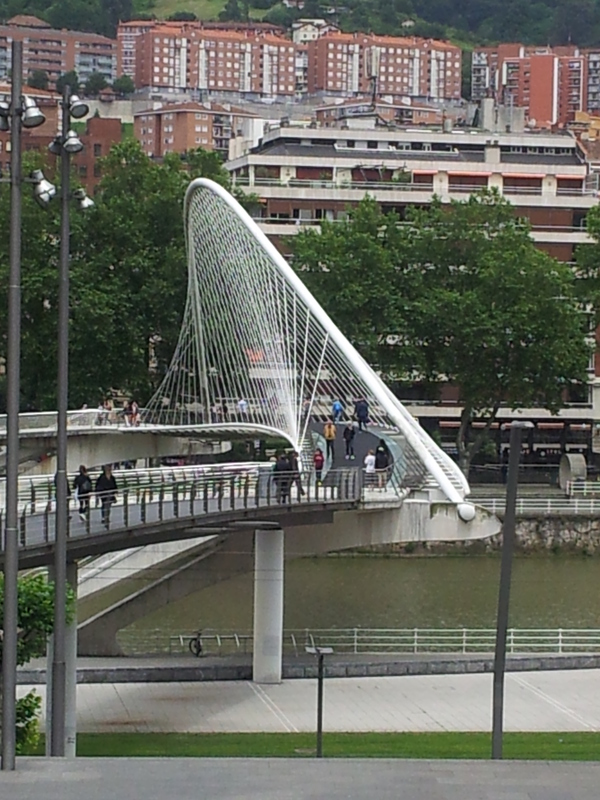 Out of town we hit a massive road system, with the most complex pedestrian and cycle bridge system you have ever seen. Good job we had arrows to follow or I think we would still be stuck on the bridge. I think we covered 1.5k just up in the air. On the other side we had another dichotomy, to go into Ortuella or stay on the road. We were getting thirsty by now so the bars won. The sign said “Bar 500meters” I should know by now not to trust Spanish directions. The trek seemed interminable but eventually we arrived at a bar. The beer was good and when he topped our water up he gave us ice as well. As you can see from the picture it was getting warm now, so the ice would not last long, but it was welcome anyway. We soon joined a cycleway that weaved uphill. The guidebook says nothing of the uphill only downhill. I was confident we would go down as the next place was seaside, but the downhill was a long time coming. When we hit Playa de la Arena the first thing we past was the tourist office. Instead of directing us he took us straight to an apartment block. I was worried about the price and we had to wait for a German couple to book in before we got any sense. It was only 50e and the apartment was lovely, we even had a big balcony to hang out our washing. Beer on the beach time then. Food here was again a problem, but we managed to get a meal at eight in a place tucked away behind all the beachside bars. A Short day 21.6 kilometers the book said 22k today, but we are 1.1k short of Pobeña, the final place on todays stage. I think we made a wise choice though. We left through the centre of town right past the peace museum. 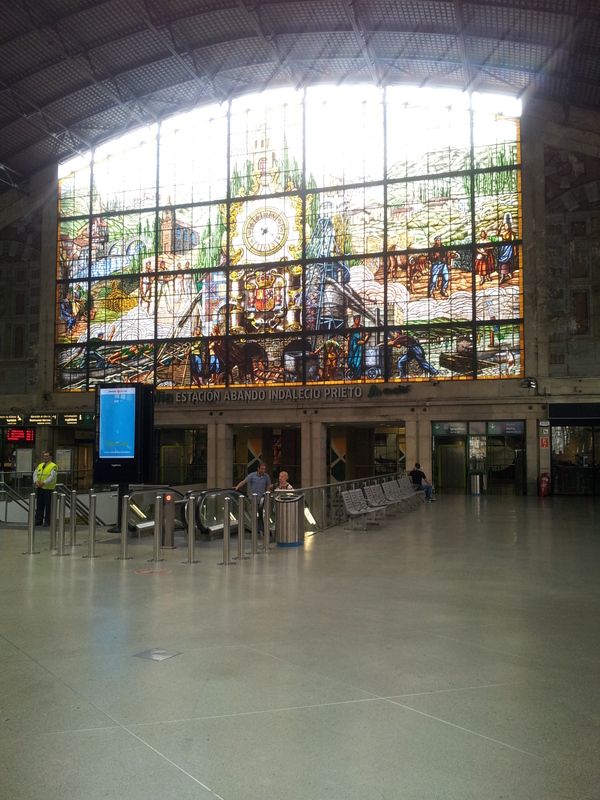 Then carried on through more sub urban sprawl until we arrived at a hermitage and suddenly Gernika was gone. Then we had a pleasant walk in the woods, not for the last time Viv commented “just like Delemere”. After 7k we crossed under a main road, a cycle race flashed passed and Viv took some pictures of them as they passed. We noticed some strange markings on the road here, arrows going in the opposite direction. Then we saw a runner then another soon they were passing regularly. At the top of the hill was the Church of San Estaban, by this time we were being passed by many walkers as well. The church entrance was blocked by crew from the walk giving out water, so we passed. In need of a rest now we stopped and sat on a log while more of the walkers passed. There was a lot of sharp climbs after this and some quite muddy. Fortunately the rain that had plagued us had not affected these paths so at least we were saved the heavy boots. It was a long time before we were free of the walkers coming the other way and we were back on our own to enjoy the quiet. At the next town we stocked up on some brioches and chorizo, it was due to be a long day so we needed to be prepared. We crossed a main road and were into a steady climb. We bumped into the two Spanish guys from Markina again and from here we kept passing them as they stopped and we stopped. The climb was interminable with no place to rest. In the end we put our mats down in the grass to eat our brioches and drink gasiosa. 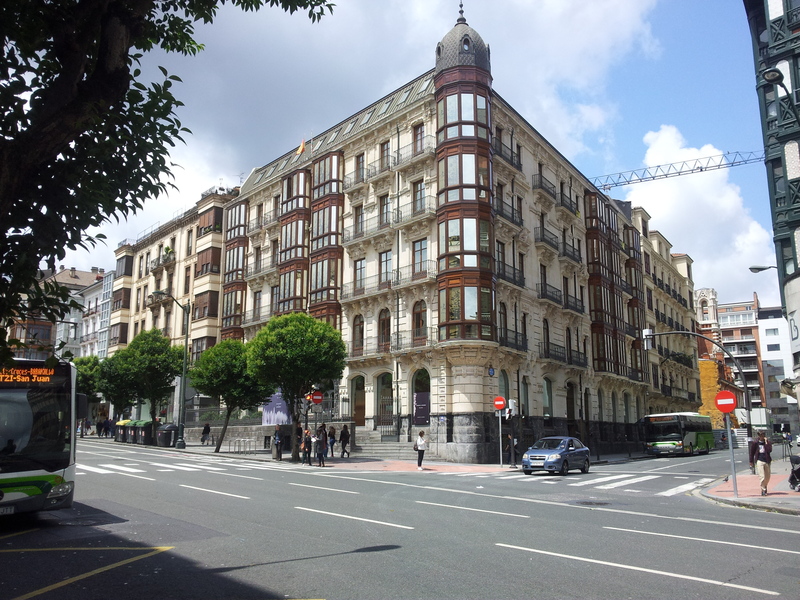 The book promised us an “Uphill into an enjoyable park with Views of Bilboa”. It did not quite work like this, we had already crested the hill and taken a punishing downhill section before we came to the park. We may have already stopped but the bar at the exit to the park was too much of a temptation and as we sat outside we could finish our brioches with the beer. We were joined again by the two Spaniards also rehydrating on San Miguel. You would think as we are in a park that we were there, not so. Still another 7k to do and some more punishing downhill, steps this time, the book describes this as “a long series of steps”. We found ourselves in the centre and Viv was excited to see a frozen yogurt shop, closed, but possibly later. The tourist office was also closed so we were on our own. After a couple of loops we found a decent hostel and got ourselves washed and free of boots and rucksacks. Later the frozen yogurt was a disaster. There was a queue of about six people, and the girl serving thought she was an artist. Fifteen minutes we waited and watched as she created a master piece of yogurt sculpture and high art. Two others joined the queue and left and as not one person had yet actually received a yogurt, so we left as well. Around the corner we found an ice cream parlour, so we had ice cream instead. Free cactus if you bought a kilo, well we could not eat a kilo and what would we do with a cactus anyway. Besides, as I sat with my ice cream, they were annoying me. Every time I moved I got stuck by one. 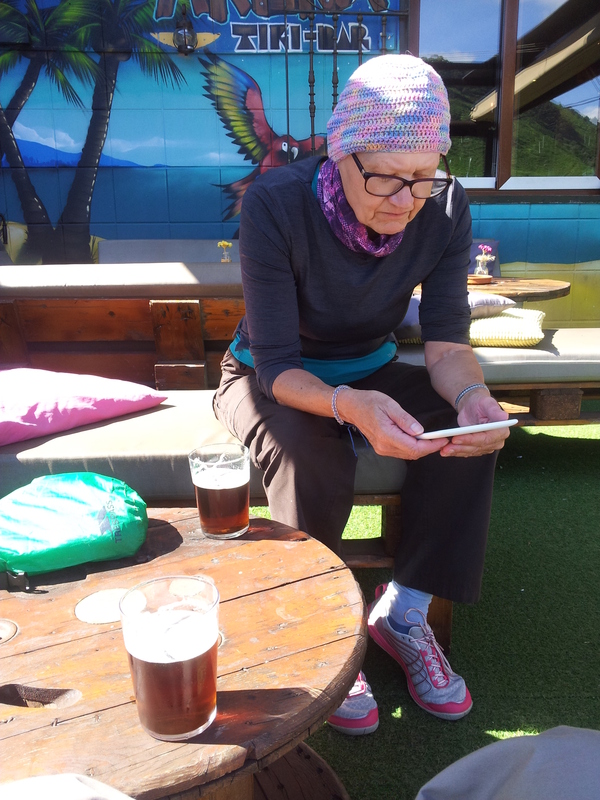 There was a bar just by our hostel, so we had a beer but no food and no wifi. We explored the Plaza Major again no one was cooking. We never did get to see the Guggenheim after a long day we were just too tired and running too late. Still at 31.1k we somehow managed to be 4.4 k short and although we are probably 1k short of the youth hostel, it is far better than exceeding the distance each day.